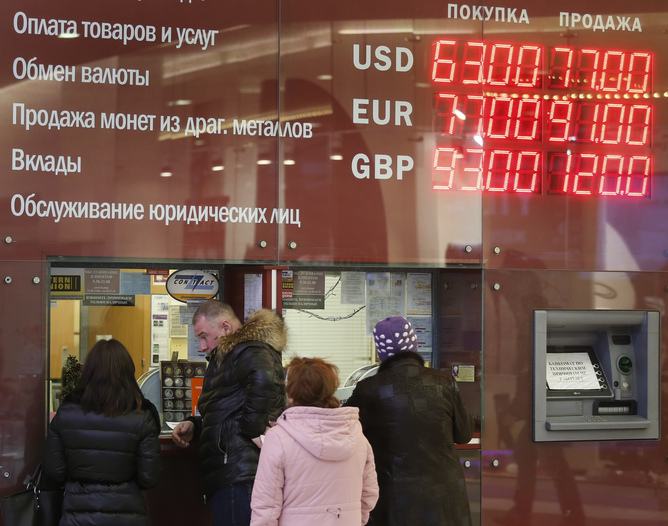 The Russian rouble started 2015 in much the same way it finished 2014: badly. 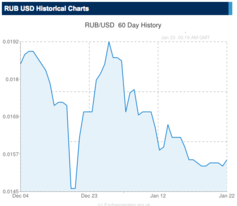 After losing nearly 50% of its dollar value between July and the end of the year, the rouble lost a further 7% in January. The primary cause of this continued decline is the falling price of oil: Brent crude has dropped from US$53 dollars per barrel at year end to just under US$48 per barrel, a decline of nearly 10% for the year so far. It’s a cause for concern for the Russian economy. A range of forecasts – from the European Bank for Reconstruction and Development, the World Bank, the IMF and several ratings agencies – all conclude that Russia will experience a severe recession this year. In response to this rapidly deteriorating economic situation, the Kremlin has approved a new package of anti-crisis measures and made a number of key changes to Central Bank in recent days. The problem is, the structural issues at the root of Russia’s economic problems are not being addressed and recent measures signal the further control that Vladimir Putin is taking over the Russian economy. After a meeting with ministers yesterday, Putin gave general approval to a package of anti-crisis measures, known formally as the “Plan for sustainable economic development and social stability in 2015”. Though some questions on how the measures will be financed remain unanswered, the thrust of the plan is clear. It will focus on re-capitalising Russia’s most important state-owned banks to the tune of around 1.4 trillion roubles (that’s US$21.6 billion at current exchange rates). These banks will in turn be expected to expand lending to Russian companies, especially those who operate in areas of the economy that compete with importers. This way, the leadership hopes to raise Russia’s capacity for self-reliance. In this respect, the plan is as much a response to the deterioration in relations with the West as it is a plan to deal with impending recession. With its focus on increasing liquidity in the banking system, the plan is similar in substance, if not in scale, to the package of measures deployed to combat the recession in 2008-9. That proved expensive, but was ultimately successful. However, rolling out similar measures this time around has the whiff of generals planning to fight the last war. It assumes that Russia today faces similar problems to 2008-9, which were primarily to do with the worsening of external financial conditions. Unfortunately, the problems facing the Russian economy today are severe and structural in nature. Quite simply, the growth model that generally served Russia so well between 1999 and 2012 has broken down. Thus, although the steep decline in oil prices is important, it has not caused Russia’s economic woes – it has simply exposed them. As a result, reigniting growth will likely require a lot more than an increase in liquidity. Instead, serious and sustained structural reforms are required. This week’s plan, alas, does not propose such reforms. As well as avoiding any serious reforms, the sums allocated to the plan are relatively modest. Unlike 2008-9, when a fiscal stimulus of around 13% of GDP was deployed to fight the recession, this plan is very much an austerity anti-crisis package. The anti-crisis measures come amidst the backdrop of several important personnel changes at Russia’s Central Bank. First Dmitry Tulin relieved the deputy governor, Ksenia Yudaeva, a leading liberal economist, of responsibility for monetary policy. This was followed by the appointment of Alexander Torshin to the post of deputy governor in charge of relations with the government and parliament. In both cases, the appointments are significant for what they tell us about the trajectory of economic policy in Russia. Tulin is known as a safe pair of hands who knows the banking system inside out. It is rumoured that Russia’s Security Council, a body not known for its expertise in economic affairs, encouraged his nomination. His appointment suggests that a principled approach to monetary policy based on market-oriented values may make way for a more pragmatic approach in which Tulin will do what is necessary to fight any fires that may break out in the banking system. Torshin’s appointment was ostensibly made to improve the flow of communication surrounding Central Bank actions. The Bank was heavily criticised in December when interest rates were raised without warning. Many believed that the bank could have done more to communicate the reasons for its actions to the political leadership and the wider population. But communication flows both ways: it is also possible that Torshin will be expected to communicate the views of the Kremlin to the bank. If so, this will mean that the bank’s much-vaunted independence will be eroded. Taken together, recent events offer clues as to the direction in which economic policy in Russia is heading. There is an increasing emphasis on using the levers of the state-dominated financial system to target lending at sectors selected by the leadership. There is also yet more emphasis on the value of import substitution and boosting the resilience of the economy from outside forces. Plus, the plan makes no mention of reducing military spending, which will account for a large share of public spending in the next few years. Defence and security clearly trump other considerations in economic policy. And finally, the appointments at the Central Bank hint at the creeping erosion of the influence of liberals, both at the bank and within the wider economic policy team. Putin is not to prone to making sudden changes when it comes to government policy. Instead, he tends to move incrementally towards his objectives. Recent events need to be viewed in this context. Slowly, however, it seems the Kremlin is using the slowing economy and the deterioration in relations with the West to assert greater control over the Russian economy.